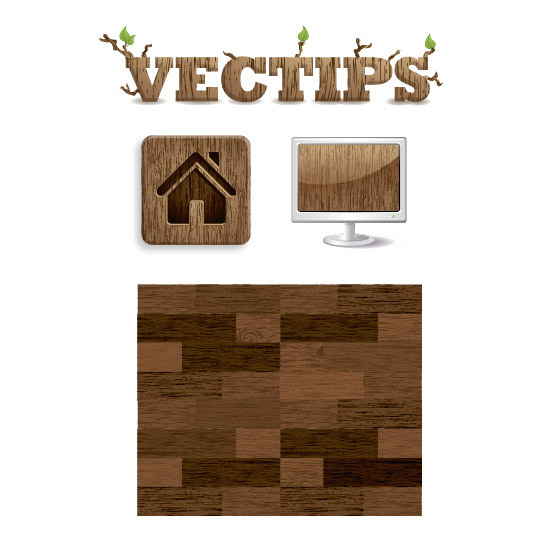 Last up for Vectip’s Texture Week is wood grain. The steps for this technique are very similar to the previous Brushed Metal Texture tutorial. It uses the same Graphic Pen effect but stretched a little more. It also uses the Warp Tool and Twirl Tool. Also like the other texture tutorials, this technique is easy and applicable in logos, icons, interfaces or pretty much anything. 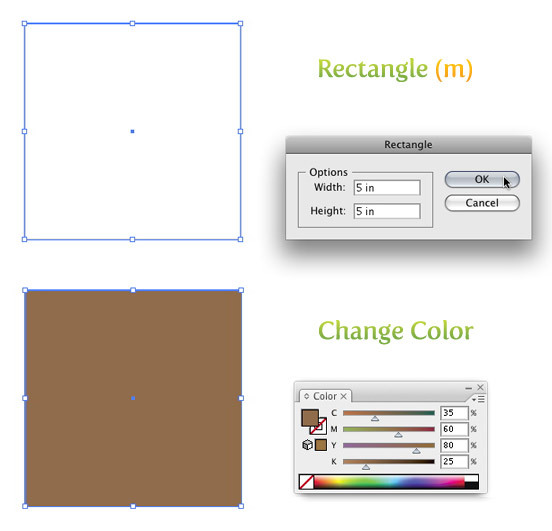 Create a 5 inch by 5 inch rectangle with the Rectangle Tool (m). An easy way to draw an exact rectangle is to click on the artboard with the Rectangle Tool (m) to bring up the Rectangle dialog to enter dimensions. Fill the rectangle with a light brown and take off the stroke. Next Copy (⌘c) the rectangle and Paste In Front (⌘f). With the copied rectangle selected, change the dimensions for the width to 2.5 inches and the height to .25 inches in the Transform Panel and fill the rectangle with a 40% black. Select the smaller rectangle and go Effect > Sketch > Graphic Pen. When the Graphic Pen Effect dialog comes up, change the following settings. With the texture selected go Object > Expand Appearance. With the texture still selected, the Control Panel defaults to the Live Trace options. Click the arrow beside the Live Trace Button and select Tracing Options. Or you can go Object > Live Trace > Tracing Options. You don’t have to change all the options, just the ones below. 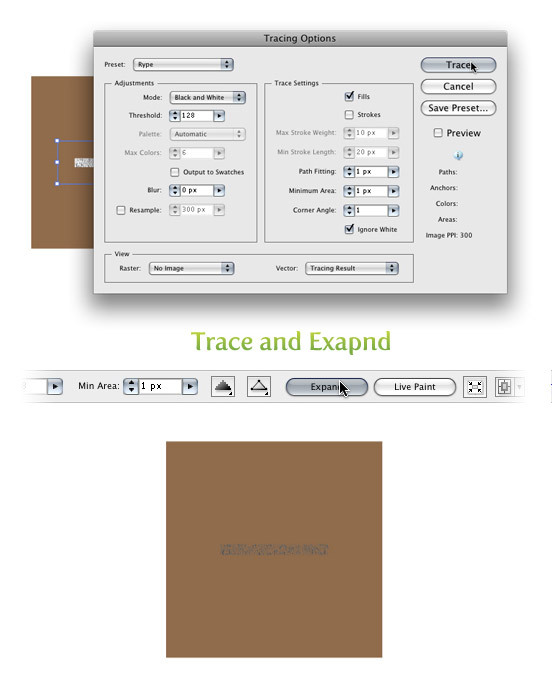 With the texture selected, change the width to 5 inches and the height to 5 inches from the Transform Panel. Next, change the color of the texture to a darker brown than the first rectangle. Double click on the Warp Tool (shift r) in the Tools Panel to bring up the Warp Tools Options dialog. They are probably on the default settings, but if they are not, press the reset button on the right of the dialog. Once the settings are back to default, change the Intensity to 10% and click OK. Select just the texture and click and drag with the Warp Tool (shift r). I like to go up and down and slightly back and forth. You can do as much or as little as you want. Click and hold down on the Warp Tool (shift r) in the Tools Panel to bring up the other transform tools. Pick the second tool in the list called the Twirl Tool. With this tool you can add some knots to your wood texture if you want. Double click on the Twirl Tool in the Tools Panel to bring up the Twirl Tool Options dialog. Below are the settings I change. With the texture selected, click and hold on the texture until you are happy with the knot. The Twirl Rate is slow so it is easy to see when you need to let go. You can experiment quite a bit with this technique. 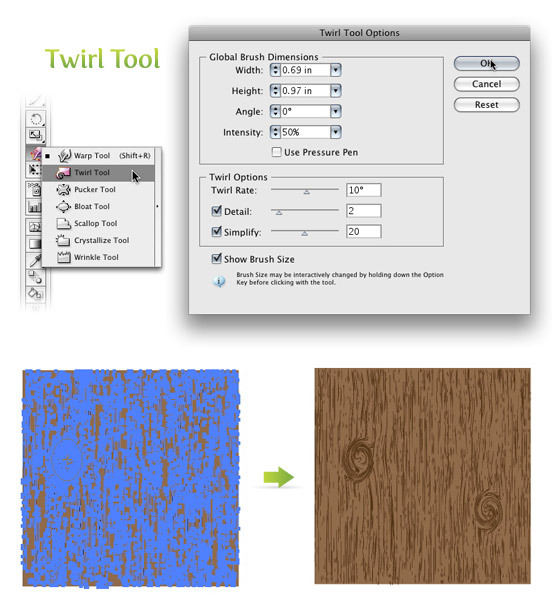 You can change the dimensions of the Warp Tool and Twirl Tool to create different wood grain texture and shapes of knots. Below are some example uses of this texture. Awesome Tut! Thank you very much! 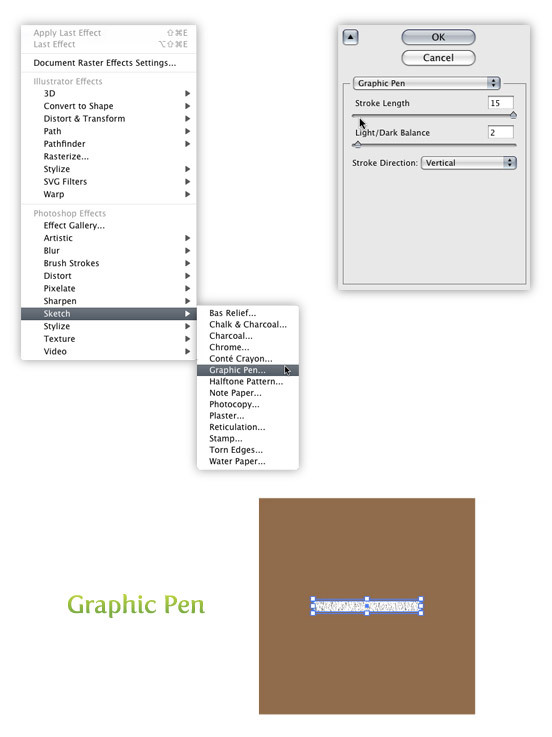 Pingback: Tips For Using Illustrator’s Warp Tools | Lagaoo | Blog Master. I found it very interesting and useful to create amazing effects with this tool. You can choose Adobe Flash web designer yourself so as to get the best results. Smart Albums and more can be created. Despite some limitations, Adobe Photoshop Elements 9 is a good overall value for the cost. that doesn’t mean you will be scavenging for a download free of photoshop. Does this scene or scenes work well for the rising action. Amazingly clever! I’ve always wanted to know how to do this illustrator and this is seamless! when i try to change the colour to darker brown,it doesn’t work. is it because when in the tracing option, the mode is black and white? idk why i cant change the colour except with black-white color mode, does anyone know what i did wrong? thank you in advance. Do you have a similar tutorial for CS6 instead? Because it looks different from what you have so I cant follow the tutorial. I’m still trying to figure it out because I’m not getting the same result. However, the tracing options now have their own window. So basically go to “Window->Image Trace” in Illustrator CS6. The graphic pen effect however is not working for me. I do not get anything close to the result he gets and when I increase the size it completely loses the wood effect I’m trying to achieve. Must revise this tutorial for CS6. In any case, thank you very much for at least giving me an idea. Thanks, just used this technique! Thanks alot !!! Your life saver. Aaaahh I have been looking for a tutorial like this for ages! Thanks! Wow!this tutorial was really helpful for me! thanks. You just saved me $20, as I would have had to buy a wood texture online to match the quality of the one I just made using your tutorial. Thank you. I’m a novice, so I’d like to ask a very silly question: after we create the wooden pattern, how do we fill our drawings with it? (for instance, the vectips writing you posted in the end). Thanks in advance! Can you apply this to a beveled 3d object? I don’t know if I’m just missing a step but it’s giving me issues. I feel ignorant… my graphic pen function seems to be disabled when I select the smaller rectangle to implement the third step. Any ideas why?! (I am inexperienced in Illustrator have never used this feature before) Thanks for any tips!!! I am anxious to follow through with this tutorial! this is very over-the-top and silly. you can simply use the tool to create the texture(in black and white), then copy a brown layer on top of said layer and reduce its transparency. This method would also leave more leverage with tone. certainly like your web site but you have to check the spelling on several of your posts. A number of them are rife with spelling issues and I find it very bothersome to tell the reality on the other hand I will certainly come again again. Loved this! Very simple ro follow. Did you just play around with the colors and opacity of th browns to achieve the wood floor? I really like that. Thank you, i have finished this texture it’s beautiful, but i have a question, i now i want apply this texture to another object how i can do it?…how i can save it as a texture? I really appreciate this tutorial. I needed to vectorize a comp I originally did in Photoshop. 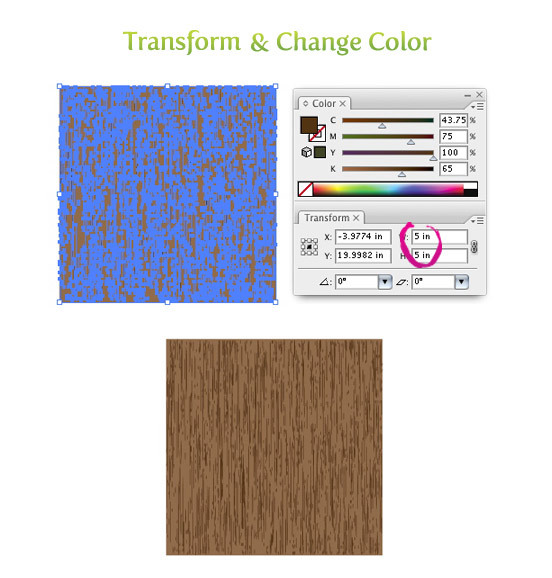 The wood grain image I used in PS did not like to be tamed by Illustrator’s tracing options. This tutorial provided a nice, consistent, realistic texture without over- or under-exposed areas. Thanks! Very Nice!!! Loved this Tutorial! Great looking Wood Texture! Mine came out great, enjoyed this Tutorial. Thanks for sharing. you might be selecting the bordered rectungle – it can be seen at the borrom of your toolbox. You should have a colour for the center of your rectungle and no colour for the border. 1st time I tried, I got the wrong texture lines as I used the shown above settings for the sketch filter. Than I tryed to imitate the shown effect using my own settings. And one more thing – this texture looks much better when scaled to more little object at the end. If it doesn’t help, please show some screens to us. this didnt work at all for me. i tried multiple times trying different thing and following it step by step and it would not work. I am pretty good with illustrator so i dont know what is wrong. “Trace” and “Expand”. That is amazing! cool! how did u make the icon with the house cutout? I always woundered the same thing. maybe someone on here can answer the question. How did you do the one with the home engraved in the square and the bevel look? It’s awesome! Really nice tutorial 🙂 Really like the end result. Thanks for sharing your knowledge. As I know about Adobe Illustrator a little bit and also I have been used it for some designing. The effects and drawing of Illustrator is more clear than the Adobe Photoshop, since it is a vector graphic software. very well information you write it very clean. I am very lucky to get this information from you. How can I save the texture, so I can use in other works? Thanks for this post–I really like it!! I finished the tutorial. However, now what ? How do i get this wood looking picture in my text ? Anyone got a tutorial for that ?
. You just need to buy another Kindle. You will have to play a pit with the tools . Mine didn’t come out the same either. i had to change them a bit! 40% black is the plack color with opacity of 40%. I have it 0n 50% , works better for me! I have the exact same issue. I’m wondering if it’s different versions of Illustrator? Doesn’t really make sense but that’s all I can think of. I don’t get near as many lines and no matter what settings I change I can’t get anywhere close. Quite frustrating but it’s an awesome tutorial. Thanks for this post – I really like it!! This same thing happened to me too. Have the object selected and on the control panel on the left hand side you will see a colour box. Mine was filled with grey and all I did was choose a colour from the box and it changed it for me. Hi just what i was looking for. As commented above though, I have done this tut over and and over again down to the T but the grain looks nothing like yours. Thx so much for the technique!! It looks real! this technique is easy and applicable in logos, icons, interfaces or pretty much anything. how do i create a stone tiles then? Wonderful tutorial, i really liked it.. I looked at the western font tutorial, but i’m not sure exactly which part of it is the technique used to make the embossed house button in this tutorial. It would be really great if you made a quick tutorial on how you achieved this effect because there don’t seem to be any. thanks! Hi, great tutorial, but I have problem. How can I save this texture? I would like using this one like a textures in graphic styles. Similar like I see on your show under tutorial. Sorry for my English, I hope, you will understand me. Hey I really like this site – thanks a lot for letting me know about to make this. I’ve been looking for this vector for a long time! Thanks dude, it’s really what i needed. Just what is need. Thanks for that. Very good tutorial. It really helped me. Thanks for posting! I’m having some problems with just one step.. On the tracing options my AI CS2 on my PC doesn’t have the Ignore White check box.. Is there a work around for this? I’m coming up with strange results on my texture. You can go ahead and trace and expand like in the tutorial, then use the Magic Wand to select all the white shapes and delete them. Let me know if that helps. 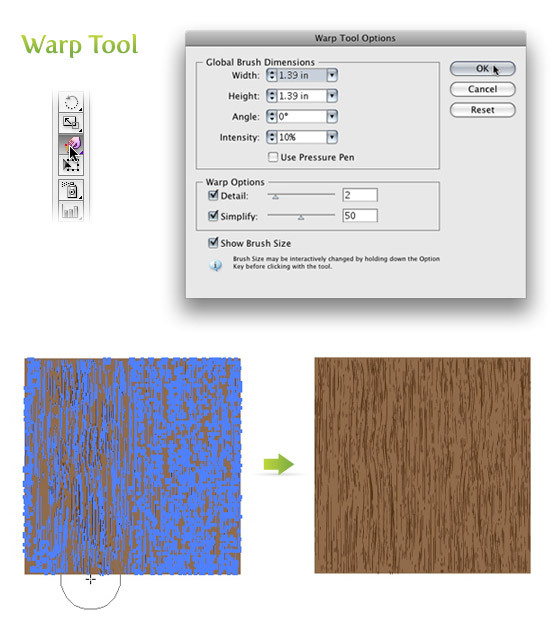 I have been looking for an easy guide on how to create a wood grain texture Will any of these methods work in photoshop? How do you make 3d effect on object like the house icon ? Actually I apologize, as you already answered the same question some months ago. That will help. However, the house seems to have much more shadow effect. Moreover did you use the same effect on the icon outline ? I was able to get really great results by using the circlewarp tool in a variety of different sizes for a variation of knots in the wood. Finding decent wood textures is ALWAYS a pain, and now I can create my own anytime. Very impressive and useful tutorial. Thank you very much. I followed you instructions and it worked like a charm. I learned quite a bit and like screwing around with the settings. I am making a brochure for a horse farm and can now give it that “barn” look with a little wood grain. Awesome tutorial and easy to do! I never thought about creating something like that in illustrator. Thanks for the technique. Easy to follow and many thanks for sharing your knowledge. However, I tried the after expansion (CS2) the texture turned black, so I had to texturize again, expand, ungroup. Curious about what effects you used to create the little house icon…..? I am pretty interested as well on more details about the little house icon realization. How did you create the cut out of the house in the wood grain texture example. Was this done in Illustrator. Can this effect be used for text. Thanks for your reply and the link to the Susa font. How did you create the example with the house carved into the wood? I just wrote a tut for Vectortuts with a similar effect. Let me know if that helps! Thanks a million. That’s exactly what I’m trying to achieve. You are a charm. You should create a link in the Related Posts section on this tutorial to the Smokin’ Western tutorial. Thanks again. Great job!!!! u got one with how to make water texture :-)! Nice effects, and you make it sound ridiculously easy! great! just great. Ill be checking this website more often. I love you, man! Thanks a lot for this tutorial. I’ve been dying to make a wood texture for my artwork. Awsome, your a life saver! This is a great tutorial. Once the texture is created how are you using it in type and other shapes. Are you using a mask? I’ve tried that but it says there are too many elements and then ultimately doesn’t work. Do you have a tutorial on how you did the icons on that you used the texture to make? ps. thanks for your very helpful tutorials. Wow, great work. Thanks a million for this. I’m trying to make this but I have a problem. My texture effects are disabled, i have the rectangle selected, but can’t get texture available. don’t understand why. I’ve AI CS2 and have tried to make it work but I can’t. What can I do? It might be the Document Color Mode Settings. Try going File > Document Color Mode > RGB Color. Let me know if that works. Scott, Did you ever figure this out, I am wondering the same thing? I would be very interessted to know how you did the second one in the final exemple!?? that icone with a house inside? Can you help me? love your tutorials! but i have a problem applying the texture. cause the graphic pen effect won’t apply. it can’t be choosen (sorry,i don’t know the correct words for this).thanx before!! Oh god. If i was a chick id find u and kiss u allover… since im not: Thanks mate, you obviously own! The reason some of you are running into problems I’m guessing is because your original illustrator needs to be 300dpi. I noticed when mine was coming into live trace after applying the effect it said it was only 72dpi so I created a new document and made sure it was 300 dpi. Hope this helps. Thanks for help Devin! I had the same problem as Ard described. Now, after setting 300dpi, is result perfect. Some people have been running into a problem when they forget to expand and trace the Graphic Pen Texture before they scale it. But, I’ve a little problem: my wood texture look very different from yours. The outcome of the graphic pen effect is totally different from yours. Your result has a lot of stripes (sorry, I don’t know the right word for it in english), but mine does have just a few broader stripes. I’ve no idea what I did wrong, because I followed everything you told to do. I hope you can help me out. Thanks in advance! Thanks for the great tutorial. I referenced this page in my recent post on the same topic. I got a couple of useful comments about using the wood grain effect to create a sort of wood flooring background. You can check them out at iphonelemurs.com/blog. I love how you use filtered effects and then Live Trace. I’ve seen you do this kind of technique before, but I still haven’t applied it to my work. I have to experiment more with that kind of technique. It’s a good workflow you demonstrate with great results. Thanks. There is no quick way to create a tile from the texture, but it can be done. It is painstaking process. I will put a tut soon with some tips, and tricks for seamless tiles. In the meantime check Veerle’s on the subject. first of all I’d like to say a thank you for sharing your knowledge, very great site and perfectly designed in every pixel. Just one question remained after reading this tutorial: Is it possible with Illustrator to make the created texture ’tile-ready’ because this way nothing guarantee that the created texture part will fit together with itself. I’ve checked and it does not, the texture’s top and bottom borders do not match (neither the left and right borders but these can’t be observed). I somehow get a very different result at the graphic pen step. This gives me a very strange effect when I resize it back to 5 by 5 inch. I’m not sure what I’m doing wrong. This is so GREAT! It’s the most realistic vector wood grain effect that I’ve ever stumbled upon. iStockdiary also has a great post on realistic curtains that make a great texture. Another good texture tutorial from Rype. The wood seems to have a rougher grain. Here is another different method on creating a smooth wood texture. Yup, it is compatible. When you trace the effect, it is nothing but basic paths. Is this effect compatible with eps 8.0? I would need it for stock. I just stumbled upon your blog through Smashing Magazine, and I’m a fan already! This is a great tip, and something I have struggled to achieve in the past. You rock! I’m glad everyone likes the post! Brad, I’m glad you ventured into the site, but also glad you use the RSS. When I first saw this tut I thought, “Why would I want to do that?” But having an editable woodgrain in vector format opens a lot of possibilities. Thanks for the great work. Also, I usually read your posts in a RSS Reader, and am always pleasantly surprised when I venture to your actual site. Beautiful layout and coherence to your identity. You are the illustrator GOD. Whaou! Textures with Illustrator! That’s definitely interesting. its amazing on how you use the illustrator tools to make this kind of effects! the logo looks very nice! It’s amazing how illustrator amazes me every day we these simple step by step tutorials!